We are unable to rate this ICO at the moment. There are to many questions about the development roadmap, vesting schedule and ico distribution to provide a definitive score. Because of this we give it a neutral score for now (2,5 from 5) We addressed our concerns to the GoNetwork team and they promised to supply us with a response, as soon as we have all the required information. The rise in Ethereum’s popularity to become the number one alternative to bitcoin creates opportunities for companies to develop their own ecosystem built on top of the Ethereum network. However, there are some challenges to overcome before mass adoption of the technology can become a reality. As I have written about before in our previous reports, there are a few problems plaguing the Ethereum blockchain right now. Scalability,- and latency issues are seriously hindering mass adoption at this time. Furthermore, at present time, Ethereum remains focused on delivering a stable and scalable blockchain technology on desktop computing platforms. As such, much of the new development is not particularly suited to the nature of mobile computing. GoNetworks belief centers on the fact that Ethereum, ERC20 tokens and cryptocurrencies in general require mobile accessibility and interoperability to gain mass adoption​. This belief is based on the fact that Google has said it is now bigger on mobile than on desktop in 10 countries. More than half of Facebook users now connect to the site with just a mobile phone. Mobile has become the primary device for the masses. GoNetwork is a team of highly motivated people that want to create a low-cost, low-latency and highly scalable network for Ethereum that can not only be used on desktops, but also on mobile and web platforms. As mentioned earlier, the blockchain, while extremely innovative, has a few hurdles it needs to overcome to achieve adoption. For example, the number of transactions per second that most popular cryptocurrencies can handle is extremely limited compared to what’s needed for the technology to be used globally. GoNetwork’s goal is to solve these issues by bringing together a strong team and investing heavily in research and development to build a fast, cheap and scalable mobile-first off-chain transaction network for Ethereum. Their platform is already in the development process and is expected to launch soon once the technical structures are set up. What problems are GoNetwork trying to solve? Ethereum transaction latency is measured in the order of of minutes and deviates wildly. Any updates to the state of the blockchain require gas, including Ether transfers and Smart contract invocation. Depending on network utilization, the cost to execute a smart contract within a time bounds varies greatly. At present time, Ethereum remains focused on delivering a stable and scalable blockchain technology on desktop computing platforms. What is GoNetworks masterplan to solve these issues ? GoNetwork aims to solve the problems of today’s blockchains by using state channels simular to the approach of Raiden Network. A state channel is a technique that allows two people to start a transaction with one another on the blockchain, and then move off the blockchain chain for unlimited numbers of direct transactions with each other until they are ready to confirm the transaction, which is then done on the blockchain. State channels can then be further improved to create a network of individual state channels so every user on the network is eventually connected to each other via a series of indirect connections. GoNetwork path to mass adoption will be through the development of GoExchange, a virtual goods exchange that will unify app economies across mobile platforms allowing users to seamlessly trade and purchase virtual goods across game ecosystems and between users. GoExhange will leverage the 15m downloads from GoNetworks hit mobile gaming platforms and includes titles such as : Happy Park, 2012 Zombies vs Aliens, Happy Monsters, Flappy Zoo, and Dubsquad. Users of these apps will be able to purchase GoTokens and start using it within all compatible apps to increase demand. GoExchange’s unique go to market strategy aims to reach a critical mass on mobile. Scalability on GoExchange is provided by GoNetworks state channel implementation. Each merchant sets up a state channel with their user base. Users can then easily send direct payments to the Merchant. More so, leveraging GoNetworks Mediated Transfer, users are able to send transfers to other users in the Games Network with the Merchant acting as a mediator for transfers. Pocket is a smart mobile payment platform with both a Merchant and User view, Pocket enables ERC20 tokens​ ​to be used for day to day commerce or for payments within the GoNetwork ecosystem. Launch of crypto to fiat debit card: the gotoken debit card lets users spend GoTokens anywhere like fiat currency. How do state channels work? When (A) wants to pay (B) multiple times in ERC compliant tokens, (A) opens a state channel. The channel works by making deposits to an escrow smart-contract. This deposit ensures that (A) is always good for the amount that (A) signs. Transfers can never be higher than the on-chain deposit which is managed by the smart- contract. Both participants can close the channel via the smart-contract at any point in time. (A) deposits tokens on-chain in an escrow smart-contract. Payment to (B) takes place off chain by privately exchanging messages which digitally sign the transfer of value. To close the channel, (B) submits a valid transfer signed by (A). This transfer is used as cryptographic proof of his entitlement. The smart contract understands this proof and pays out the tokens (B) is entitled to and closes the channel. A state channel can also be combined into a network where a path connecting any two participants can be found. This allows for payments between two participants who do not have a direct payment channel between themselves. In such a network lots of payments can happen concurrently and independently without the need for global consensus. Transfers are secure and trustless as they are backed by a deposit on the blockchain in an escrow smart contract. There is a key difference between the Raiden Network Solution and GoNetworks solution. State channel essentially lock up funds until the channel has been settled/closed. Reducing state channel creation is important; Raiden overcomes problem by creating an overlay network which routes systems through online nodes. Mobile p2p networks have limited network guarantees as individuals move from region to region, as such, implementing a routing scheme such as raiden is not feasible for mobile network architectures. Instead, GoNetwork implements an incentivization scheme rewarding actors based on the longevity of state channels. 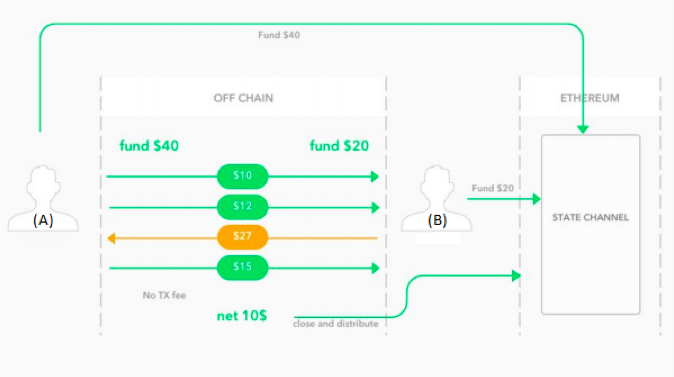 Incentivizing long lived channels allows GoNetwork to effectively redistribute the costs of creating state channels back to its participants. I have contacted GoNetwork about their Roadmap, their current Roadmap does not go into details about the development of spites and state channels (which is the most important part of their whole proposed solution). I was promised by the GoNetwork team to receive an update about it soon and I will update our report accordingly. GoNetwork is a team of highly motivated people with over 30 years of cumulative experience in computer software, mobile apps, game development and blockchain technology. They just won the world’s largest Hackathon ‘ETHWaterloo’, which proves that the team is comprized of young talents who are eager to make a difference in the Blockchain community. Founder of Infinidy Corp, one of Canada’s leading game development studios. Graduated from the University of Waterloo, Ontario, Canada. Created the biggest iOS theme park simulation game called Happy Park. Over 15 million people have downloaded Infinidy’s games! Founded Dubsquad that became one of the largest video social networks among teens worldwide with over 1 million users. Software architect & Blockchain expert. Graduated from the University of Toronto, Ontario, Canada. Spearheaded research and development while working at BlueRover as Vice President of Software Architecture R&D. BlueRover is a leading Canadian Internet of Things (IOT) technology company. Graduated with distinction and honours in Software Engineering from the Universtiy of Waterloo, Ontario, Canada. Xun is the co-founder and CTO of Infinidy Corp. He is a serial entrepreneur who has created products that have been used by millions of people and have acquired a large active user base. Led Infinidy to become one of the first companies to join Communitech, Canada’s top digitial media incubator. As a Software Engineer at Google, Harry has worked in the Gmail extensibility platform. He has also lead Android development for the Google Fiber project. He worked as a Software Development Engineer at Amazon on their payment platform. 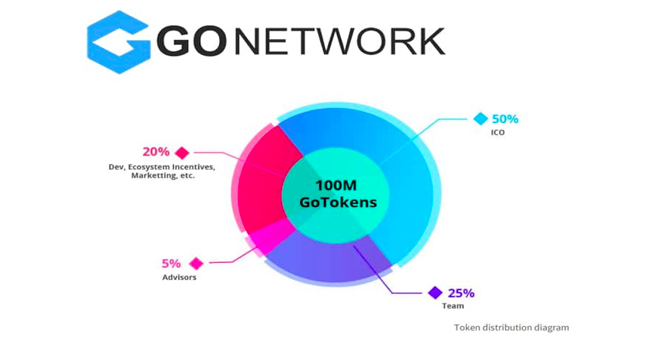 How are GoNetwork (GOT) token used? As a utility token to create state channels: GoTokens are a utility token to create and close State Channels. Opening or closing a state channel requires a small transaction fee that is paid for in GoTokens. Purchase, trade, sale of virtual goods: GoNetworks route to market consists of creating an online marketplace to buy trade and sell virtual goods. They are leveraging their already highly popular games such as: Happy Park, 2012 Zombies vs Aliens, Happy Monsters, Flappy Zoo, and Dubsquad to gain traction towards the goal of mass adoption of their technology. GoToken will allow for transactions within the GoExchange platform. No scaling solutions as of yet: There are currently no solutions to solve the Ethereum scalability and latency issues yet, although there are some ongoing projects that are trying to solve these, such as sharding, plasma and switching the Ethereum network from PoW (Proof of Work) to Pos (Proof of Stake), none of these have materialized yet. Ambitious and talented team: The team behind GoNetwork is undeniably a top team with deep expertise in mobile development and software architecture. Rashid Kahn, the CEO of GoNetwork, is also founder of Infinidy Corp which is one of Canada’s lead developing gaming studio’s. The rest of the team members are equally well qualified and where therefore able to win ETHwaterloo, the world’s largest Ethereum Hackathon. Existing customer base: Through Infinity, the company of Rashid Kahn, they already have a target audience with millions of users to kickstart their product once ready. If implemented properly, their solution can accelerate mainstream adoption fast. Limited expierence: Although the GoNetwork team has shown to be quite capable of building succesfull apps, this does not automatically mean that they can build infrastructure solutions like state channels. It is a big project they are undertaking with an idea that (untill now) only exists on paper. Untill we see an MVP or at least an updated project development roadmap, it is nothing more than an idea. Also, the team may be very technical experienced but they have never led a large company, It would be interesting to see if.. and who they will hire to address this issue. Large portion of tokens reserved for the team: We believe that the 25% of tokens reserved for the team is high, especially if they do not provide awnsers about the vesting schedule. I have asked for a reaction to this question and am awaiting a reply. If there is not a clear defined vesting schedule (token lockup period for the team), there is a big chance that a lot of these tokens are dumped immediately after they are released on an exchange and this will negatively affect the token value. *) The Ethereum Foundation will offer grants to qualified teams interested in developing blockchain scalability solutions, Vitalik Buterin, co-founder of Ethereum, announced in a recent blog post. This certainly will have a negative effect on the GoNetwork ICO. We are unable to rate this ICO at the moment. There are to many questions about the development roadmap and vesting schedule to provide a definitive score. Because of this we give it a neutral score for now (2,5 from 5) We addressed our concerns to the GoNetwork team and they promised to supply us with a response, as soon as we have all the required information, we will update this video presentation.